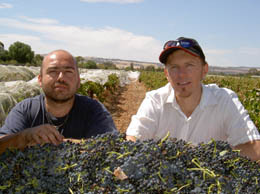 The Old Plains and Longhop range of wines are produced by Domenic Torzi and Tim Freeland. The former Gawler high school mates seized upon an idea in 2002 of salvaging some of the last remaining old vine vineyards in the Adelaide Plains and making icon wines from that region. Vineyards were secured, old vines a priority. Our small band of growers have since embraced the ideal of delivering premium grapes in order to showcase the power and rich fruit flavours the Adelaide Plains and adjoining Mt Lofty Ranges has to offer. "...escaped the vine pull of the 1980s." Great wine begins in the vineyard and for Old Plains and Longhop nothing is more important. Our vineyards are unique, remnant plantings that have mostly survived urban expansion and the pursuit of other agricultural profits. They also escaped the vine pull schemes that were popular during the 1980s. These government sponsored schemes saw old, low yielding vines uprooted with the help of subsidies and replaced by cash crops of vegetables and wheat. In some instances vast tracts of old vine shiraz was replaced by chardonnay! What a waste. The remaining small vineyards are true masterpieces of wine grape flavour, weathered, gnarly and magnificent in their defiance of commercial expansion. Wine made by flavour not by numbers, is one way of describing our approach to winemaking. Its a year round, hands on approach that makes our wine unique. The hard work never seems to end but seeing the wines evolve over time is truly rewarding. Where did Longhop come from? We often get asked where the name Longhop came from. And like most things we've done it just sort of evolved out of need. It was 2005, just before vintage. Old Plains was preparing for its third vintage of small limited production wines from the last old vines in the Adelaide Plains. The previous vintages production of about 300 cases had all sold out to the USA. Aussie wine was hot property and on the back of plenty of Parker Points we were a happy bunch. Another small boutique production for 2005 all basically sold before vintage. Well, literally a week before vintage the phone started ringing, growers on the 'Plains were getting dropped by Fosters (which became Southcorp, then Treasury Wines etc etc,) this was creating havoc, typical of the big wineries, picking and choosing who they screw at the last minute. Growers were pleading for us to help, we weren't really in a position to do anything, no money, no processing facilities, no time. As the days ticked by a good mate was frantic, he had about 40t of shiraz, had a big mortgage on his vineyard, him and the missus had just had a new baby, all the while working at GMH to pay the bills. We had to help. Right lets come up with a label and try and sell it to the US. Great idea. As with most things we just do it. Anyway Freeland awoke one morning after a particularly heavy night and scribbled down "LONGHOP" on a sheet of paper. We thought this was pretty clever, sort of a play on the critter label, without a critter, a stab almost at the excess of refinery wine, the fact a multinational dropped a grower, bringing the label to life was a little ironic. Not to mention the fact longhop is a cricketing term, even more confusing for the Yanks... we'd played plenty of ding dong back yard test matches between us around that time. Well we made the wine, sold the lot to the US then about 10 months later the arse end fell out of the US market and the Dan Philips/Grateful Palate schmozzle, but that's another story. 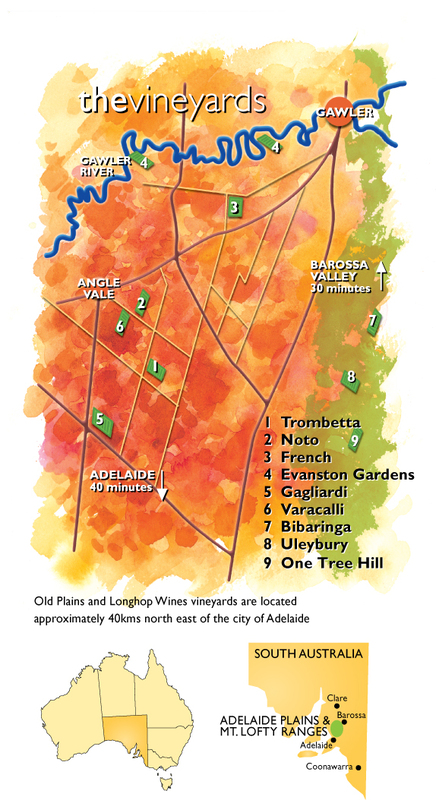 We shifted our focus to the domestic market, secured a nice patchwork of small vineyards across the Mt Lofty Ranges and the passion that drove us in the beginning still lives on in the Longhop label to this day.